Do we really need to put telescopes in Space? 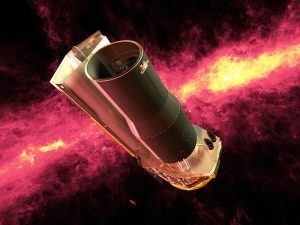 This week we celebrate the Spitzer Space Telescope’s 15 years in Space. Inspired by this achievement, we would like to look at the four NASA Great Space Observatories and their main discoveries. We all know that there is more to the light that meets the eye. The electromagnetic spectrum stretches from high energy gamma rays, through X-ray, ultraviolet, visible, infrared and microwave, to low energy radio waves. Each wavelength is associated with different process and therefore tells us its own story about the object. Astronomers learned to make telescopes and instruments that detect different wavelengths. But every time we look through the telescope, the Earth’s atmosphere gets in the way. Some wavelengths pass through the atmosphere better than others. For example, the atmosphere blocks gamma, X-ray, ultraviolet (most of it) and some infrared radiation. But it lets the radio waves (up to 10 meters) and long microwaves through. Most of the visible light passes through the atmosphere but the air distort it on the way. That results in blurry images. Astronomers tried different ways to overcome this problem. They often build telescopes high in the mountains and launch detectors on air balloons and planes. But it was clear that the best solution to the atmosphere problem would be to lift the telescope above it. To launch it into space! In 1946 an American astrophysicist Lyman Spitzer wrote a paper “The astronomical advantages of the extraterrestrial observatory”. Spitzer’s vision led to the construction and launch of the four NASA Great Space Observatories sensitive to different wavelengths! 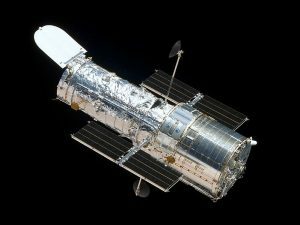 The famous Hubble Space Telescope was the first of four Great Space Observatories. Launched on April 24, 1990 it is now in its 29th year of operation. Hubble is the only mission that was services by astronauts (and not once, but five times!). 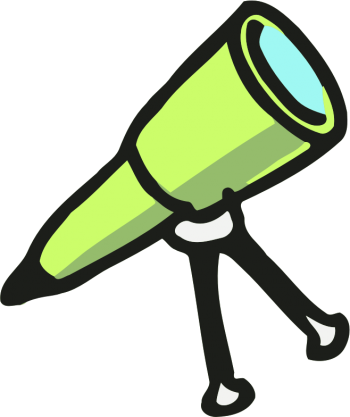 Name: The telescope was named after the American astronomer Edwin Hubble (1889 – 1953). Hubble discovered that there are other galaxies outside our Milky Way, offered a simple classification of galaxies and estimated the rate of the expansion of the Universe. Discoveries: Deep Field images made by HST allowed us to peer into the early Universe. Hubble revealed that the Universe is expanding and that the rate of expansion is increasing. (A group of scientists received a Nobel Prize for this amazing discovery.) The telescope detected a vast amount of interesting objects, such as exoplanets, Kuiper belt objects and many more! 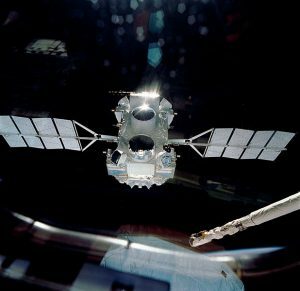 The second observatory launched on April 5, 1991, less than a year after Hubble, was the Compton Gamma Ray Observatory. It is the only one of the four telescopes that is no longer operating. In 2000 after the gyroscope failure, scientists decided to deorbit CGRO. It reentered the Earth’s atmosphere and splashlanded into the Pacific Ocean. Name: CGRO was named after the American physicist and the Nobel Prize laureate Arthur Compton (1892 – 1962). Compton’s experiments led to a discovery of the “Compton scattering”. He proved that the light behaves like a wave and a particle at the same time. Discoveries: Gamma radiation comes from the most high energy events in the Universe. CGRO made the first gamma ray sky map. Scientists were surprised to find gamma ray bursts and blazars uniformly spread across the sky. The discovery suggests that the sources of these events are situated well outside the Milky Way galaxy. 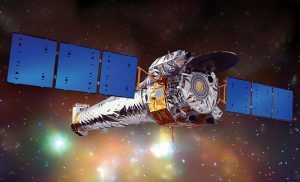 The third NASA observatory has been successfully hunting for X-ray sources for the past 19 years ever since its launch on July 23, 1999. Name: The telescope was named after the Indian American astronomer Subrahmanyan Chandrasekhar (1910 – 1995) whose theoretical work explained how stars with different masses evolve. Discoveries: The telescope showed us the high energy Universe hidden from our view: neutron stars, black holes, galaxies gobbling up other galaxies. It even hinted the existence of mysterious dark matter. NASA launched the last Great Observatory into orbit on August 25, 2003. Originally designed for a 2.5 year mission, the telescope is still operational today, 15 years after the launch! Name: The telescope’s name honors the American astronomer Lyman Spitzer (1914 – 1997), the father of Hubble Space telescope. The scientist made a great contribution to our understanding of the interstellar medium. Discoveries: Thermal infrared light allows us to see through the gas and dust clouds. Spitzer telescope studied extremely interesting regions of star formation and planet formation. It even sampled the atmospheres of some exoplanets! Read more about SST achievements here. Would you like to see what the Great Space Observatories look like? Use downloadable NASA instructions and print-outs to make your very own paper models of Spitzer, Hubble, Chandra and Compton telescopes! And don’t forget to visit our inflatable planetarium to learn more about manned and robotic space missions. Let our space dome team know!